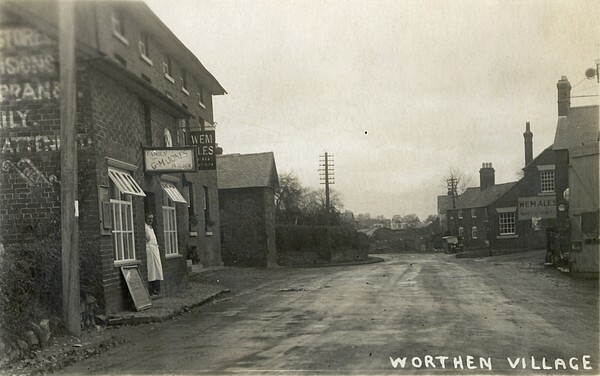 Behind the butcher's shop on the left is the White Horse hotel, run for much of the 1930s by Arthur Hope. Further down the road on the right is the Kynaston Arms public house. I think the road has a tarred surface, in which case the photo is after 1926. An earlier view of the White Horse can be found on p.18 of the booklet 'All in a Lifetime', which is all about Worthen and district. This earlier picture includes all the words on the wall to the left: 'Vaughan's General Supply Stores. For All Kinds of Provisions. Corn Meal, Flour, Bran. Deliveries Daily. All Orders Promptly Attended. Cash'. At the earlier time the store was an offshoot of the hotel business, then run by the Vaughans. Photo made available by Lawrence Blakemore.